One of the pleasures of visiting a new place is the opportunity to learn the stories and legends that are a part of the history and the culture of the place. In addition to reading the historical facts about a location, one can research the tales and folklore to add depth, and a bit of fun, to the understanding of the site. Tzfat is one such spot where hearing the many legends and tales helps to create a better understanding of the history and culture of the place. There are many legends and myths surrounding Tzfat's personalities and these give a more rounded picture of the town's character and varied past. Touring Tzfat without hearing at least of few of these legends wouldn't be a true visit to this unique and mystical town. One such story is that of Yossi Della Reina. Della Reina was a Kabbalistic Rabbi in the 16th century who, with the best of intentions, wanted to use the power of Kabbalah to try to defeat Satan. Della Reina and five of his students attempted to trap Satan and neutralize him, but Satan outwitted the Kabbalists and was able to escape, becoming more powerful than ever. Della Reina descended to a sinful life, and he was buried outside the cemetery by the Tzfat citizens of the time. His burial spot, then in a deserted field, is today next to the central square of the Old Jewish Quarter and it is custom for people to spit when they walk by his gravesite. Stories about the influence of Tzfat's women also abound. Safta (Grandmother) Yocheved was a figure that many Tzfat residents still remember, as she died only in the 1970s. Safta Yocheved believed strongly in the teaching of the Zohar, the basic Kabbalistic book. She believed that the Messiah would set forth from Rabbi Shimon Bar Yochai's tomb at Mt. Meron and would pass through Tzfat on a white donkey on his way to Jerusalem. Safta Yocheved worried that the Messiah would need sustenance on his journey, and every day, she would set out a plate of cookies and a pot of tea for the Messiah to nourish himself on his travels. 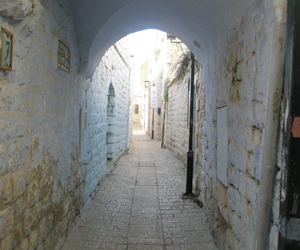 The little narrow lane where Safta Yocheved would sit with her tea and cookies is today called "Messiah Lane" and is a testament to her incredible faith that, as tradition teaches, the Messiah could arrive at any minute. Finally, Safta Ita's story is one which gave a tremendous amount of strength and support to the Jewish soldiers during the War of Independence in 1948. During the British Mandate, between 1918 and 1948, when the British ruled Palestine, the British refused to allow the Jews to arm themselves, even for self-defense. Yet the Jews of Tzfat refused to remain unarmed after the devastation of the 1929 Arab riots, and were forced to find hiding places for their smuggled guns and ammunition. They hid the arms in "slicks", hiding places, often in basements of people's homes. Safta Ita, an elderly "zaftig" (heavy) lady, had a slick in her house, and the Jewish underground often used her slick when cleaning and assembling their weapons. One afternoon, Safta Ita was sitting outside her house while a half-dozen Jewish underground members were inside with their weapons, when a group of British soldiers walked by. Safta Ita's code to the men inside her house was unnoticed, and she was worried that the loud noises that they were making might attract the attention of the patrol. So Safta Ita began to make the sounds associated with a woman going into labor. The British never noticed that Safta Ita was well past child-bearing age....being the polite British men that they were, they moved away quickly, and the slick was saved. Tzfat abounds with legends, traditions, and tales. Visitors who wish to truly understand this special town will enjoy exploring these stories as much as they will enjoy the lanes and stone buildings of Tzfat.